The pen design for the laying hens changed this year. We have more egg layers than ever, so the needed more protected space for them. The pens are pretty easy to move. They were covered with tarps this spring...in an effort to reduce the amount of chicken wire on each pen. Turns out our girls did not like the change one bit. 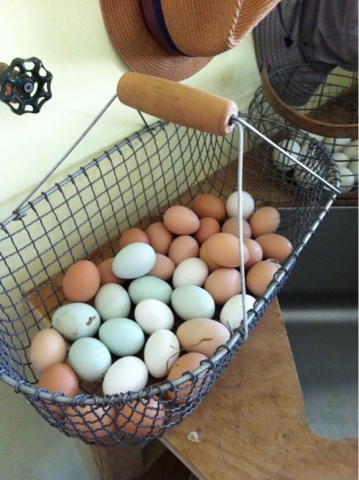 A few weeks ago we had 3 eggs from 200+ hens in one sunny, clear spring day. So changes had to be made...the bell drinkers had to go on and chicken wire, better roosts and a huge reduction in shade. Yesterday...6 dozen eggs. Same hens, no change in feed, grit, oyster shell...just water and sunshine. Or maybe it was just the change of pens and flock grouping...Homer jokes about how all girls like their homes neat and unchanged...we won't ever really know what caused our girls to stop but are sure happy to see eggs again! !